My parents have been retired for quite some time and they've been living overseas a few months out of the year. This past weekend they recently came back to visit and will be flying back in November. It's been somewhat of a tradition with my family to welcome them home with a prepared feast of prime rib. 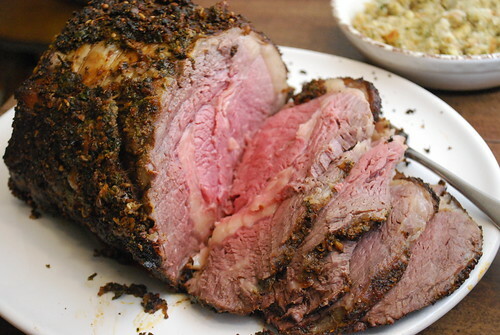 This is partially due to how we usually include this amazing roast in our holiday celebrations for as long as I can remember... but probably more importantly because my parents just don't have access to the same quality of beef overseas. So when my parents arrived, there was no question what we would have for dinner the night of their arrival - a Gluten Free Prime Rib Dinner. Although we have our favorite way to prepare prime rib, I sometimes change it up with a few tweaks, sneak in a few ingredient additions, or just give the traditional dinner a whole different spin. This time, I decided to do a fall inspired Prime Rib Dinner by incorporating some fall inspired ingredients, classic favorites and getting some delicious help with some spice and seasoning mixes from McCormick. With the increase of folks taking on a gluten free lifestyle, it's been great to see some popular brands come out with gluten free friendly products. 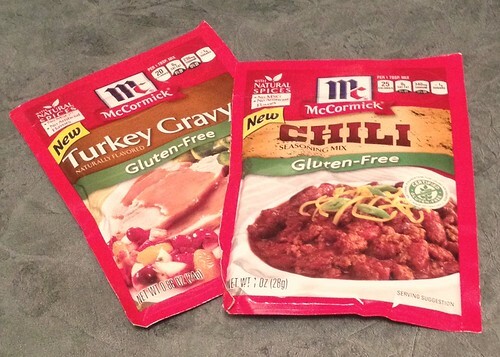 Spice and seasoning mixes often have hidden gluten in them, but now folks can take comfort knowing there are gluten free spice and seasoning mixes available by McCormick. They currently offer 4 gluten free mixes - GF Chili Seasoning Mix, GF Taco Seasoning Mix, GF Turkey Gravy Mix, GF Brown Gravy Mix. For my Fall Inspired Prime Rib Dinner, I used 2 of their GF mixes. 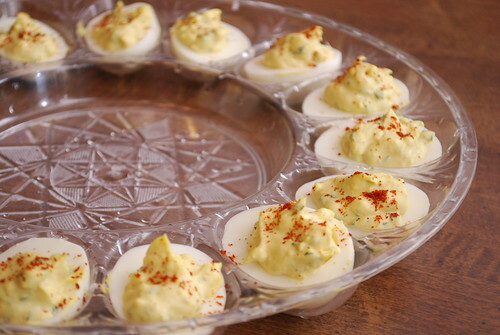 The Delicious Deviled Eggs came from a recipe taken from the AllRecipes website. It's a straightforward recipe using eggs, mayonnaise, ground mustard, parsley flakes, seasoned salt and paprika. 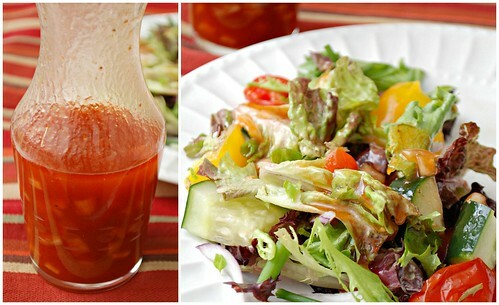 To add some vegetables to our menu, I had to include our family's favorite mixed greens salad, served with a homemade French dressing. 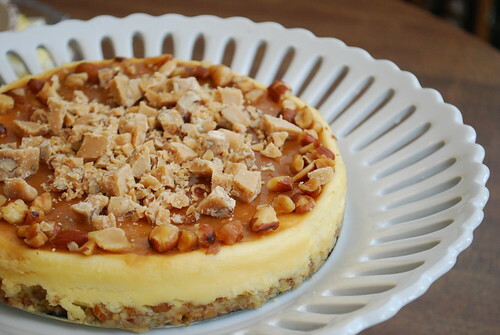 And to finish the meal on a sweet note, I made a GF Praline Apple Swirl Cheesecake filled with diced apples and Southern pralines swirled throughout before topping with a caramel glaze and more chopped southern pralines for garnish. Peel and core the apples and place on a cookie sheet. Drizzle with olive oil and sprinkle salt to taste. Bake in the preheated oven for 30 minutes to roast. Remove apples from the oven and place in a food processor. Process until finely chopped; set aside. *If you don't have time or want to roast apples, you're welcome to use jarred chunky applesauce. In a large bowl, combine the ground chicken, 1/2 cup processed roasted apples (or chunky applesauce), shredded cheddar cheese and chili seasoning mix. Carefully combine all the ingredients until fully incorporated. 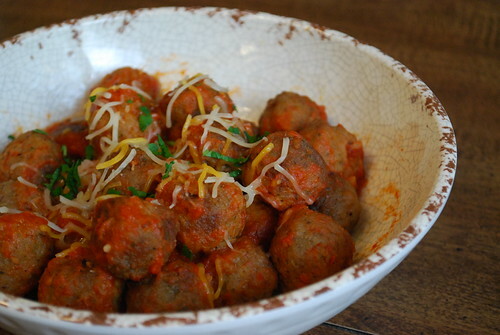 Roll mixture into small meatballs. - Preheat your oven to 350. - Place the chicken meatballs on a parchment lined cookie sheet and bake in the preheated oven for 15-20 minutes until cooked through. - Heat a skillet with cooking spray. Toss lightly in tomato sauce and garnish with cheddar cheese. Combine the coriander, rosemary, fennel seed, ground mustard, garlic, salt, pepper, gravy seasoning and olive oil in a bowl. Rub this mixture all over the rib roast. Place roast on a v-rack set in a roasting pan. 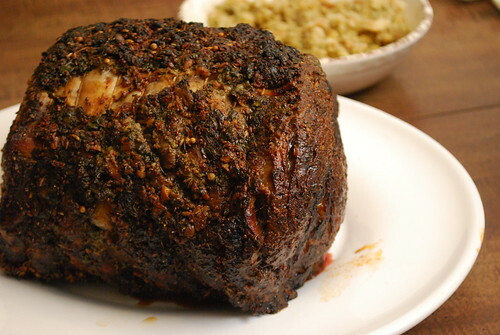 I've never made prime rib but you might have just convinced me to give it a go this holiday season!